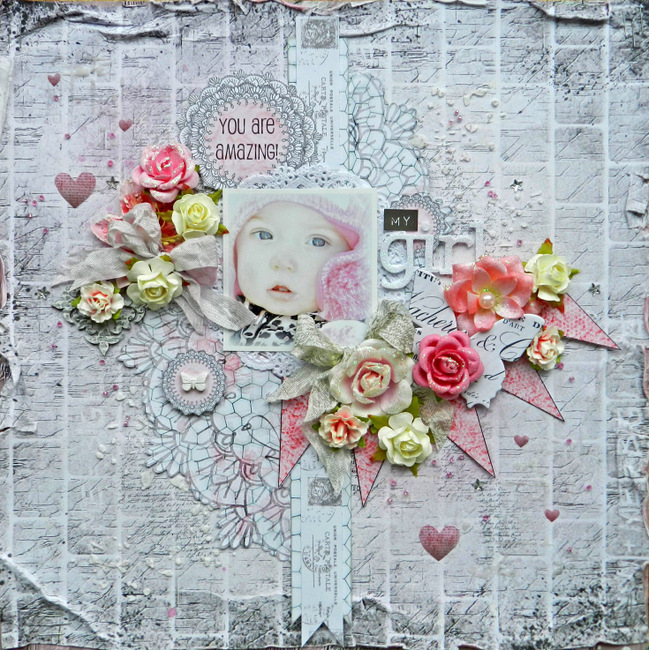 Erin Blegen: My Scrap Cabin: Guest Designer @ 13 Arts~! Hello :)! It's the weekend- and a longer one for my family as my husband got to have Friday off. So I've been busy crafting and have lots of things to share coming up in this next week! 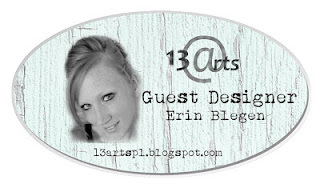 But today I'm very happy to share with you that I am a Guest Designer at 13 Arts and I have a couple of projects to show you :)~! I was lucky to be able to play with both of Ayeeda's beautiful collections, "Frosted Life" & the brand new "All is Love". I mixed and matched the two here and had just a wonderful time playing! "You Are Amazing, My Girl"
I love how these papers bring out my "artsy" side! I couldn't believe it- I actually distressed the edges of my paper :). Believe it or not, just a year ago I used to distress EVERYTHING- and generally had multiple layers in my distressed edges. But it's something I've gotten away from- not for any particular reason. I think I have two sides of myself constantly fighting one another: the one side that is a linear perfectionist in which everything must have its place and though my style is "full", it still wants a clean design; and then the other side of me that loves to throw a mess around and see what happens! But I think the two of these personalities came together here :). The hearts you see here are from the "All is Love" sticker sheet. I just cut them out before sticking them on. And my title was cut from the "Love Letters" paper. I love their doily-like shape! The banner was also cut from the "Love Letters" paper :). All is Love "Follow Your Heart"
All is Love "Big Love"
All is Love "Love Letters"
You probably know by now how much I love tags :). Working with these collections made putting this tag together a breeze! So many beautiful patterns just begging to be played with :). Frosted Life "Found in the Sky"
Thanks so much for coming on over to have a look. 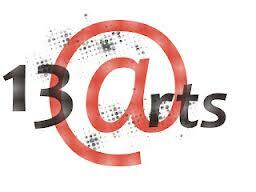 If you haven't yet, stop over at the 13 Arts blog! They're having a design team/guest design team call going on right now- so don't miss out! So soft and beautiful. Your background is amazing and I love how you cluster your flowers. I don't think I've seen these papers before, but they are beautiful. I love what you did with the layout. Everything looks perfect. And that tag--let me tell you, tags are my favorite. I love, love, love this one you made. You're layer always looks so pretty. I haven't quite mastered that technique yet. Love everything about this layout. 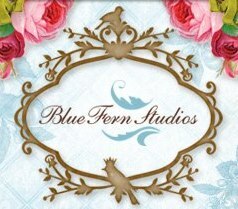 The colors,flowers,hearts,& banners. Великолепная страница, такой замечательный фон для чудесной фотографии!очень нравиться!я ещё так не умею, но хочется научиться. Du kan virkelig skabe en smuk og farvet symfoni omkring din lille skønne datter, det er bare så dejligt at se på. knus morkaren. They're both stunning...I like that artsy look...especially the distressing!! I really admire the CAS style...but find it hard to do!!! I loved the LO... It's incredibel!! My first comment vanished.. so here's for a second try! 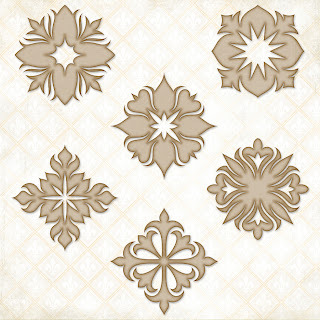 Lovely papers and congrats on the guest designing spot. I love the microbeads and that sweet tag! And your sweet little girl is just adorable. You take the best pics of her! Beautiful Erin. I think those two personalities did really well...lol. I feel the same sometimes. Want to get random but still like my balance. Perfect touch of colour against the background. And adorable pic. It's really lovely & sweet LO! The layout is just exquisite Erin! Okay, this is my new favorite!! :) Love that you kept everything clustered close together and left some white space on this one! Looks gorgeous and draws the focus right to that sweet photo! 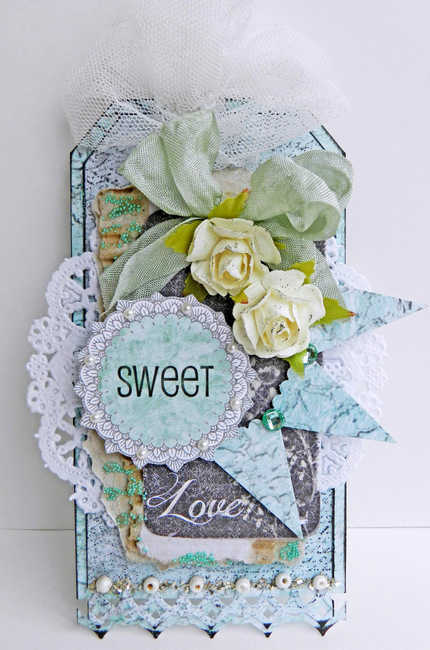 So gorgeous and sweet, both the layout and tag. You did an amazing job with the 13@rts papers!